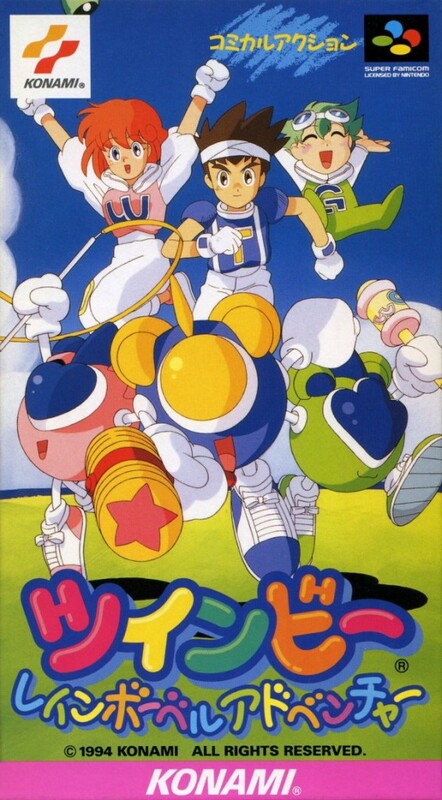 Pop’n Twinbee is a SHMUP on the Super Famicom, but Konami originated the series in the arcade way back in 1985 (Twinbee). 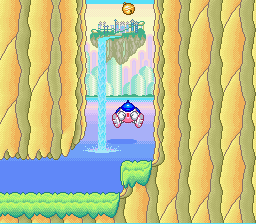 Pop’n Twinbee Rainbow Bell Adventures is an action platformer that feels like a trip on acid. It’s colorful, wild and a bit ridiculous. It’s also a hell lot of fun. 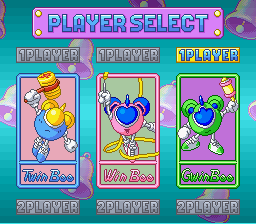 Select from TwinBee, WinBee or GwinBee. Each one has their own strengths and weaknesses. 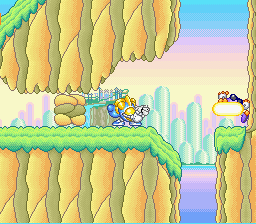 There is a punch and jump meter, and the length of each one varies from character to character. 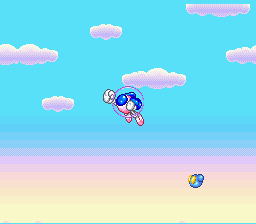 TwinBee attacks with a mallet, but only after you’ve collected the proper bell. His punch and jump meters are evenly balanced. 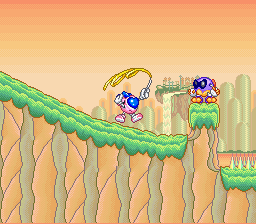 WinBee attacks with a lasso after procuring the proper bell. 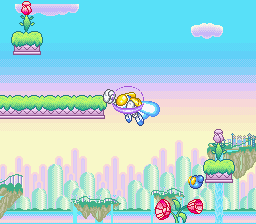 Her punch meter is long but her jump meter is super short, making her the ideal character for those who like to rack up frequent flyer miles. GwinBee throws those rattles once you’ve nabbed the proper bell. He’s the opposite of WinBee — his jump meter is awfully long but his punch meter is extremely short. So, what happens when the punch meter is fully charged? Well, this! It can be shot in any one of eight directions. This mega shot allows you to break certain sections of the landscape that otherwise impedes your progress. What about the jump meter… what happens when it’s fully charged? Well, this! 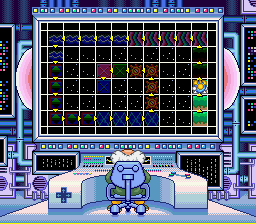 It zips you across the screen in your direction of choice (like the mega shot you can aim it in any one of eight directions). It also breaks barriers as such. 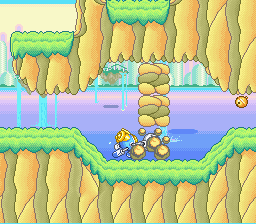 Killing enemies and collecting the various colored bells is the name of the game. Each color grants you a different skill or power-up. Unfortunately whenever you take damage you lose all your bells, but just kill more enemies to recollect them. 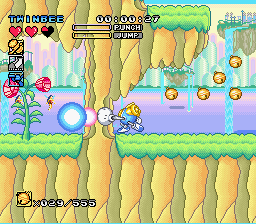 Each of the three characters can shoot a gun when a blue bell is collected. This gives all of the characters a long range shot that can be fired at any time at will. Yes, they can fire the mega shot too but obviously there is a charge time for that. On the downside, the gun cannot break barriers. It also can only be shot straight ahead. It’s nice that the game gives you choices but each choice has its own pros and cons. I love it when games do that. Makes it feel very versatile! 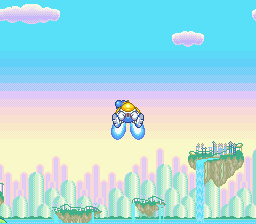 You can do some crazy flying in this game, including soaring into the outer reaches of space as the game starts to highlight your kilometers in the air after a certain height. It gets pretty ridiculous! 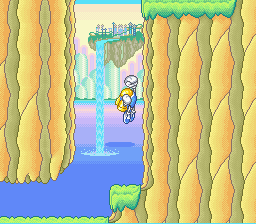 You can also float in mid-air as you recharge your jump meter. Or you can cancel the float and descend as normal. Again, options and choices. This game excels at giving you that. 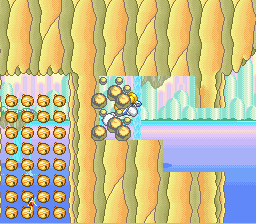 Fly all over the place — you never know when you might crash through some breakable walls to discover “hidden” goodies! Yeah, the mega shot and the gun is fun to use, but sometimes you just can’t beat smashing a bad guy over the head with a good old fashioned mallet. Good times. To top off this fun little game, you have a password system to save your progress. 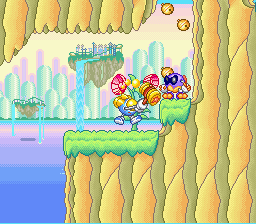 There are also two 2-player modes. The first is a co-op mode that gets a little crazy. That’s because it’s easy to leave your partner behind when one of you decides to take flight. It’s nice to see Konami included this 2-player mode but truth be told it’s not the best co-op game in the world as it’s far too easy to get caught off-screen unless you and your friend are determined to stick together. The second mode is a battle mode. This is a split screen 3 minute war where both players are pitted against one another in a duel to the death. 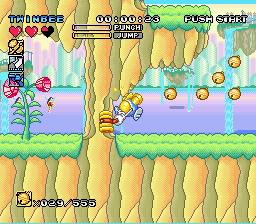 It’s an interesting option for sure as I can’t think of many SNES 2-player games that feature such a barbaric option. If you can think of another one, sound off in the comments. Hell, it’s possible this might in fact be the only one of its kind! 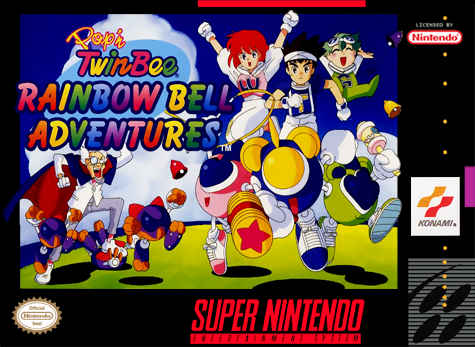 Pop’n Twinbee Rainbow Bell Adventures is a fun and delightful action platformer. 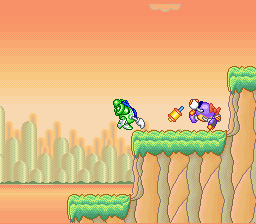 It’s easily one of Konami’s best SNES games never to hit the US. There was a PAL European release, however. 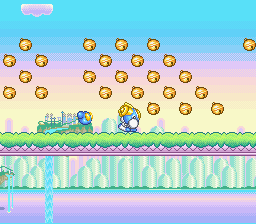 The game has some quirky and entertaining gimmicks backing it, making it a unique experience in a world bloated with way too many hop and bop affairs. 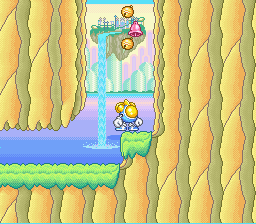 The visuals are so sugary sweet that you just might get a cavity just by looking at it. The sound is typical Konami goodness. And the gameplay is different, challenging enough and definitely loads of fun. 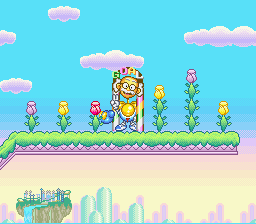 You can’t go wrong with Rainbow Bell Adventures. Konami could do almost no wrong back in the mid ’90s, and this is simply another shining example of such.